Owing Owen | What's In John's Freezer? « What’s In John’s Freezer… For You? It’s Darwin Day 2015 (or will be shortly), and also on this blog it’s Freezermas, a time of contemplative dissection of morphology and its history. This year I won’t be doing the crazy 7 posts in 7 days that I’ve done before (see 14 past ones here), and I won’t be doing a customary homage to Darwin. Instead, I’m dedicating today’s post to Richard Owen, oft characterized as Darwin’s greatest nemesis. Blasphemy? Nah. I’m a Darwin fan, sure, but today Owen gets his due from me. This post is like a “Top ten things you didn’t know about Richard Owen” post, but without the list, and some of them might be things you know, and I’m not even sure if there are ten of them, but they tend to be about Richard Owen. I feature a bunch of Owen’s papers’ coolest artwork, with links to the free versions of those papers, too. Bone up! Stomach-Churning Rating: 3/10 for woodcuts that would otherwise be graphic. 7+/10 for rabid Darwin fans. Owen was one of greatest (vertebrate) anatomists ever, if not the greatest (Alfred Romer gives him a run for his money in my opinion, but was less of a conceptual revolutionary). He was a key player in the divorce of the Natural History Museum from the British Museum and thus its move to its current South Kensington home in London as well as its autonomy and rise to scientific and cultural prominence. Hence, like today’s post’s title indicates, we owe Owen a lot as morphologists and as fans of biology (i.e. natural history). Indeed, his contributions are often undersold in deference to Darwin’s, and in service to a conventional narrative (written by the victorious Darwinians) in which he plays a villainous role. Even if one cannot admire the man as a touchy-feely kind of dude, his work demands respect and historiographic justice. I was inspired to write this post after reading a biography of Richard Owen some months ago: “Richard Owen: Biology Without Darwin, a revised edition”. It’s a fascinating read, and makes some points that challenged my naïve views of the history of biology, especially evolution and Victorian science. Author Nicolaas Rupke hammers home that pro-Darwin propaganda relegated Owen to a more minor and infamous position in the history of science than he deserved, defaming him as a cold-hearted, scheming, inconsistent jerk. This biography admits truth to Owen lacking some social graces and playing tough politics sometimes, but reminds us of his eminence in British science, which reverberated globally and was in no small part due to his determined drive and strategic rigour. I recommend the book to any fans of natural history and science, especially morphology. 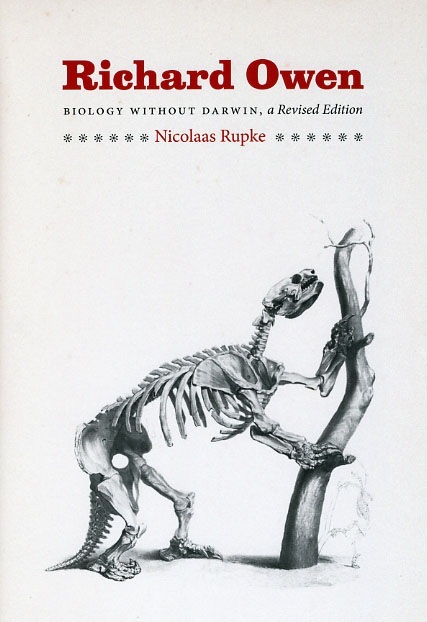 Indeed, Rupke’s 2009 edition was released in paperback for the Darwinian centennial, as an abridgement of his 1994 book. If you want to know more about Rupke’s 2009 book, there are informative reviews by Switek here and Lynch here. This biography humanizes Owen and casts away some of the demonizing. Scandalous snippets of Darwinians politicking against Owen are memorable– e.g. Owen’s “contest against the surrounding agencies” was a predecessor to Darwin’s “struggle for existence” and natural selection, which Darwin downplayed (Rupke, pp.157,169-171). As Rupke’s work emphasizes, Owen was a pre-Darwininan evolutionary biologist, not a creationist. He devised an “axiom of the continuous operation of the ordained becoming of living things” that qualifies as evolutionist, but not transmutationist. He had ideas about evolution that just seem odd to a post-Darwinian mind, especially an “internalist” driving mechanism for evolution (something about the embryo that causes evolution to proceed; not a primarily external, environmental impetus as Darwin favoured), leading to orderly patterns of evolution, not the higgledy-piggledy bushy evolution of Darwin and his successors (e.g. 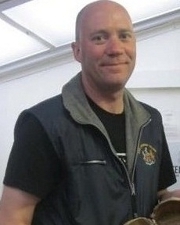 Gould). To a modern evolutionary morphologist, Owen’s “transcendental morphology” echoes of earlier continental European work by Oken (& fellow Germanics), Cuvier (& fellow French) and others, and as such often feels strange – even mystically religious (pantheistic) or unscientific. And, like many Victorians, the idea of apes including, and a subset being ancestral to, humans repulsed Owen. That revulsion seems to have clouded his judgement on the scientific matters involved, which he famously sparred over with Thomas Huxley. 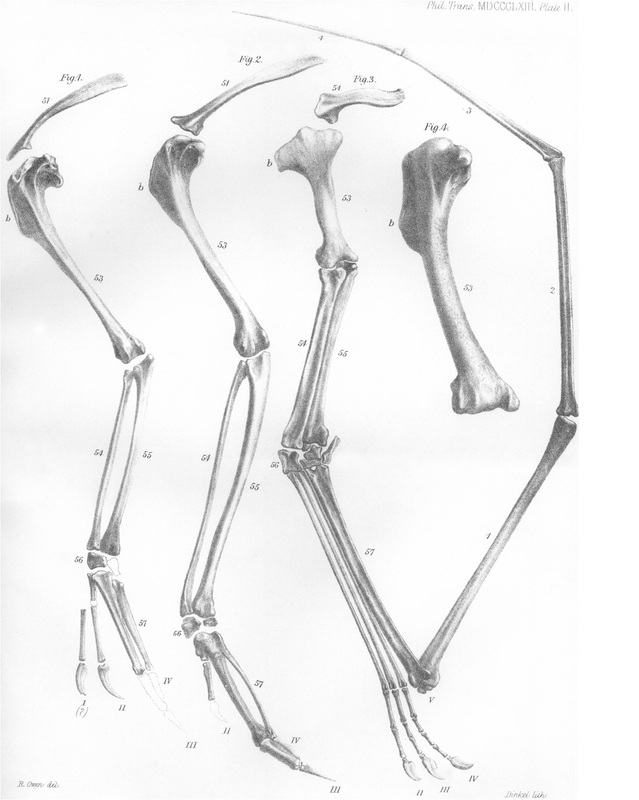 Forelimbs of Archaeopteryx compared with falcon, Pterodactylus, and humerus of a raven (left to right). Owen classifed the former as a bird, with potential relationships to pterosaurs (Rupke, pp.175-6); Darwinians like Huxley instead saw the dinosaurian, reptilian ancestry. Owen, R. (1863). On the Archéoptéryx of von Meyer, with a description of the fossil remains of a long-tailed species, from the lithographic stone of Solenhofen. 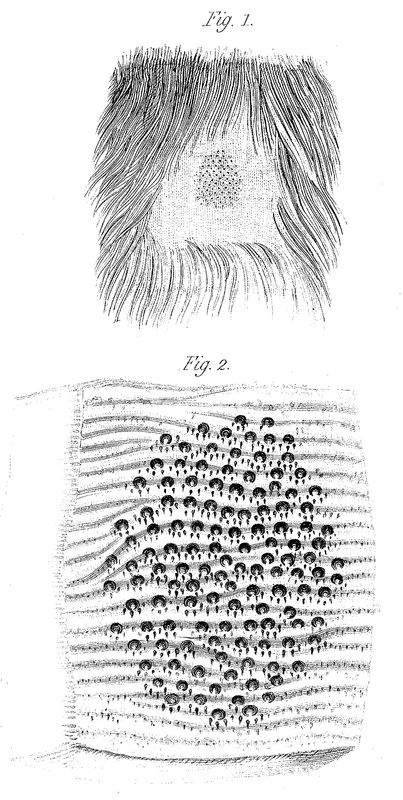 Philosophical Transactions of the Royal Society of London, 33-47. However, we can credit Owen- like Lamarck and Geoffroy Saint-Hiliare in France- as an early “evo-devo” scientist trying to link transformation across lineages with developmental mechanisms. We can also celebrate Owen as one of the foremost early champions of the study of osteology as a worthy scientific pursuit in and of itself. Much of Rupke’s biography is structured to focus on the institutional structures that Owen played such a pivotal role in creating, especially the curated collections of the Natural History Museum (which Owen spent ~1856-1881 fighting to establish as its own facility!). 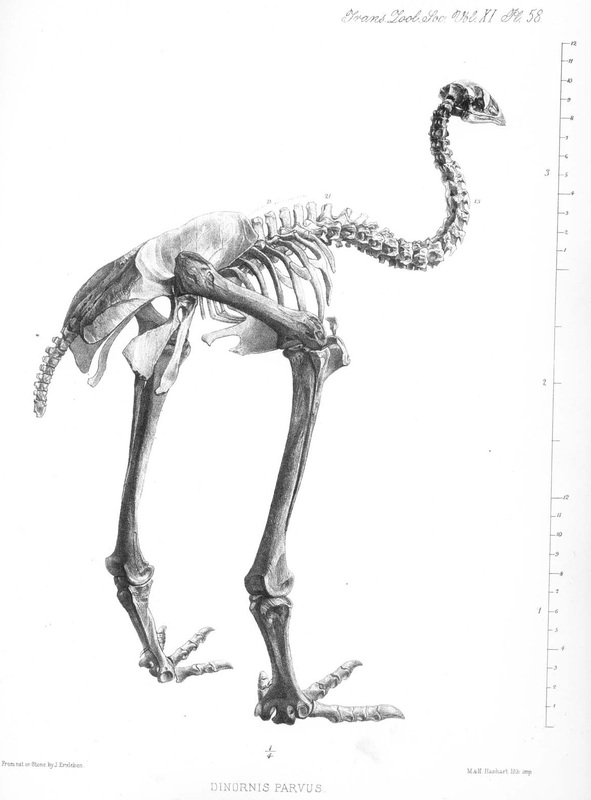 Owen’s vast monographs on Cretaceous Reptilia, the flightless moa (e.g. Dinornis; with papers covering 40 years of research that continued almost up until Owen’s demise) and odd Gondwanan mammals of the Australian colonies (many of these specimens having been shipped to the museum by Darwin for Owen’s own studies) cement his status as an integrative collections-based researcher who did not eschew palaeontological research “because biologists don’t do that”, or some such divisive nonsense that we still encounter today. Skull of a crocodile, exploded to show homologies of the bones; and a forelimb for added context. 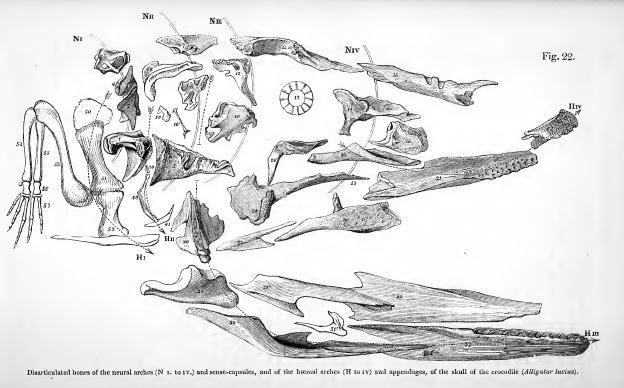 Richard Owen, Report on the archetype and homologies of the vertebrate skeleton. BAAS. Foetal skeleton of a human, with skull exploded for comparison of homologies. From Owen 1847 as above. Speaking of palaeontology, and science communication, 1841 was when Owen coined the “Dinosauria”, tying together disparate forms such as Hylaeosaurus, Megalosaurus and Iguanodon by the recognition that they were not “typical reptiles” but rather advanced in many distinct ways (e.g. locomotor adaptations) that united them as a group. We owe a lot to that early recognition, which was no facile achievement considering how fragmentary most of the early (pre-“Bone Wars”) dinosaur fossil discoveries were. Like Darwin, Owen realized that the giant ground sloths that he described (and Darwin found many of during his Beagle voyage), such as Megatherium, were related animals, too, and in this case having extant relatives. Owen, R. (1888). On parts of the skeleton of Meiolania platyceps (Ow.). Philosophical Transactions of the Royal Society of London. B, 181-191. 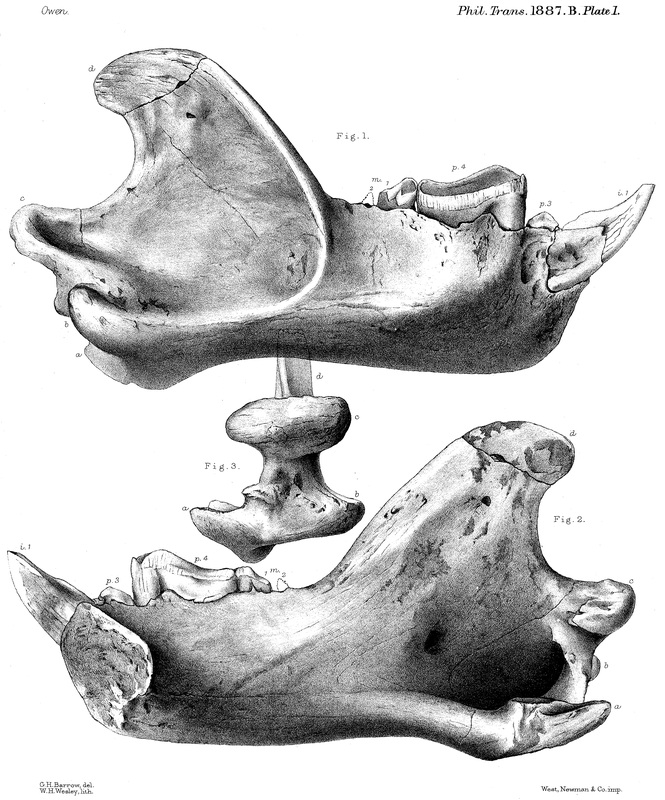 Additional Evidence of the Affinities of the Extinct Marsupial Quadruped Thylacoleo carnifex (Owen). This year (2015) is the 350th anniversary of the journal Philosophical Transactions of the Royal Society, in which Owen published key studies of exotic Gondwanan animals such as the giant, tail-clubbed early turtle Meiolania and the “marsupial lion” Thylacoleo (see pics above). Some of Owen’s most outstanding and earliest work, likewise published in Phil. 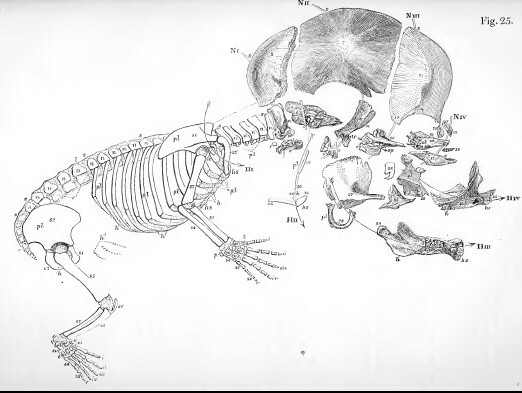 Trans., concerned seemingly aberrant mammals like the platypus (Ornithorhynchus), whose egg-laying and milk-excreting organs he detailed in 1832-1834 (see pics below). Like so many of his discoveries, these detailed descriptions and gorgeous commissioned woodcut illustrations often were sound, groundbreaking work, and are still cited and comprehensible today. Yet Owen’s interpretations sometimes became re-evaluated in a Darwinian rather than transcendentalist light, ironically building the case for Darwinian-style evolution (transmutation). Was the platypus a mammal, reptile or bird? Owen correctly assigned it to the Mammalia and recognized its relationship with the spiny anteaters (echidnas), but today we understand it better as a member of an early branch off the mammalian stem that includes a broad diversity of other species such as the multituberculates. Brian Hall wrote a review of the history of the “platypus paradox” here— it’s a fascinating story. 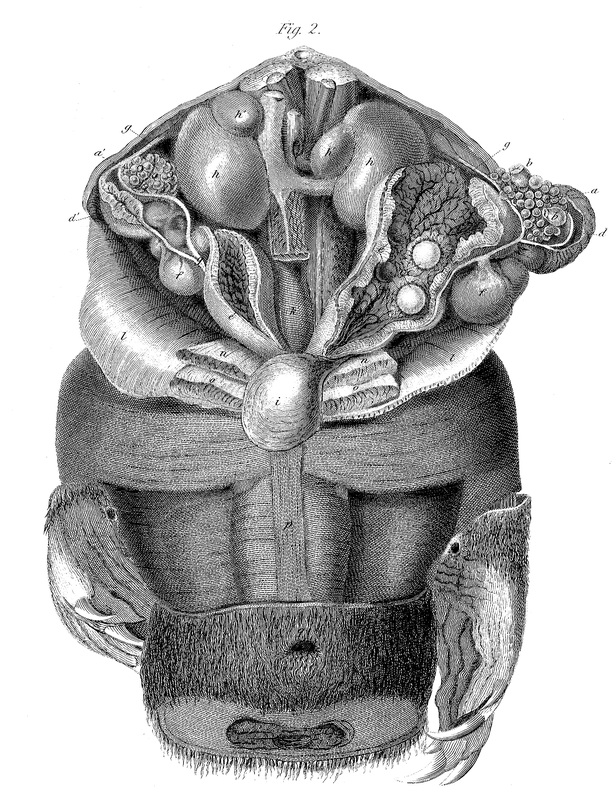 “Areola” of the female platypus in the abdominal region, with embiggened version below. Richard Owen, On the Mammary Glands of the Ornithorhynchus paradoxus. Dissection of a female platypus, showing the egg-laying apparatus. Vol. 124 (1834), pp. 555-566. 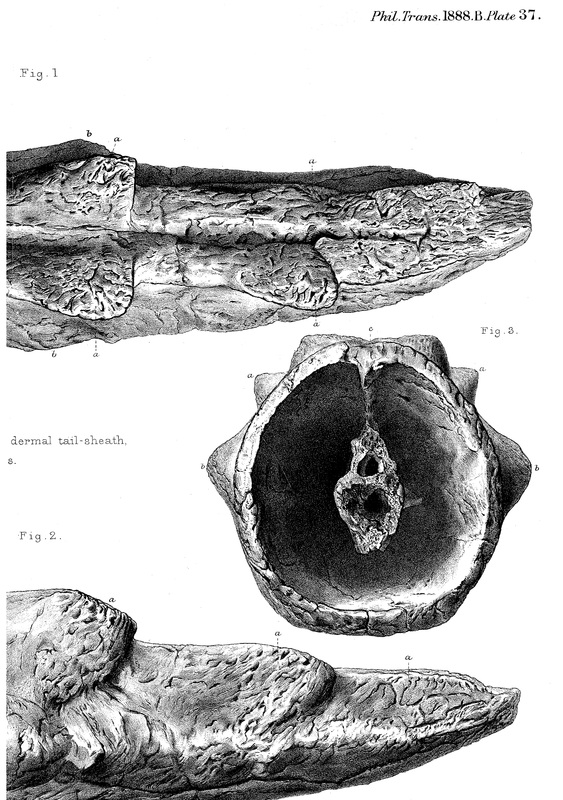 From Professor Owen C.B., F.R.S., F.Z.S., &c. (1883), On Dinornis (Part XXIV. ): containing a Description of the Head and Feet, with their dried Integuments, of an Individual of the species Dinornis didinus, Owen. The Transactions of the Zoological Society of London, 11: 257–261. So that’s my ode to Owen, which lightly touches on highlights of his storied career. Opinions vary on how fun he would have been to quaff pints of ale with (what do you think? ), but as fabled (if flawed) heroes of science go, he deserves the label, and morphologists should continue to imbibe and savour his scholarly works, seeking draughts of inspiration within their contents as gourmands of Owen-ia. With some 600 papers published by Owen, there’s surely more for us all to discover. Morphologists and friends, what’s your favourite Owen paper and why? Speak up! Legacies never really to justice to the figures who leave them. When an investigator’s personality eclipses our memory of their science, we lose sight of their contributions, attributing all progress to figures we find more palatable. When scientific contributions obscure the uglier aspects of their character (embezzlement, maltreatment of subordinates, derision of colleagues, misapplication of science to promote political/sexist/racial ideology, etc. ), we can forget how important civility and decency are to a creating an enlightened scientific community. Great post about Owen–I’m excited to learn more about him. Indeed! Thanks for posting, and for the kind comment! Ooh another Pinterest user! Followed. Welcome, Denver! I’ve never had the chance to look through Odontography (physical copy). Thank for this thoughtful essay, John. It does help put Owen in a slightly different light from how he is often characterised. One point of clarification within the paragraph below the Thylacoleo mandibles: I’m not sure whether you intended this but you’ve italicised “Echidna” which, to me, signifies the genus. Of course, extant spiny anteaters are either Zaglossus or Tachyglossus. I couldn’t remember what Echidna is so I looked it up – it’s a moray eel. Thank you John for reminding the world of Richard Owens important and nice work. I recommend and like ‘On the Nature of Limbs: A Discourse’ (Brian K. Hall as Editor). Thanks for sharing! And thank goodness some scientists persist despite haters. I’m not a biologist, but I know plenty of underappreciated professors who don’t participate in the academic popularity contests and must work harder in counterproductive environments to make their contributions. on March 3, 2019 at 11:39 am | Reply These Are A Few of Mon Préféré Things | What's In John's Freezer?